The Vibrant Body/Wise Mind course is a year long self-care immersion for women who are ready to change their lives from overworked and overwhelmed into energetic and easeful. The course is based on 10 lifestyle habits of Yoga and Ayurveda - ancient healing traditions designed to promote wellness in body and mind. The daily habits are simple, yet powerful ways to take charge of your mental and physical health. I co-lead this course with my coaching partner, Lael Petersen, YHC, LCSW. Download the course flyer for more information. Ready to make this your YOUR year? Schedule a Wellness Strategy Session with me. I'll listen to what's going on for you, and if you're ready, we'll talk more about this life-changing experience. Simple and light dinners are one of the foundational habits we teach in the Vibrant Body / Wise Mind course. 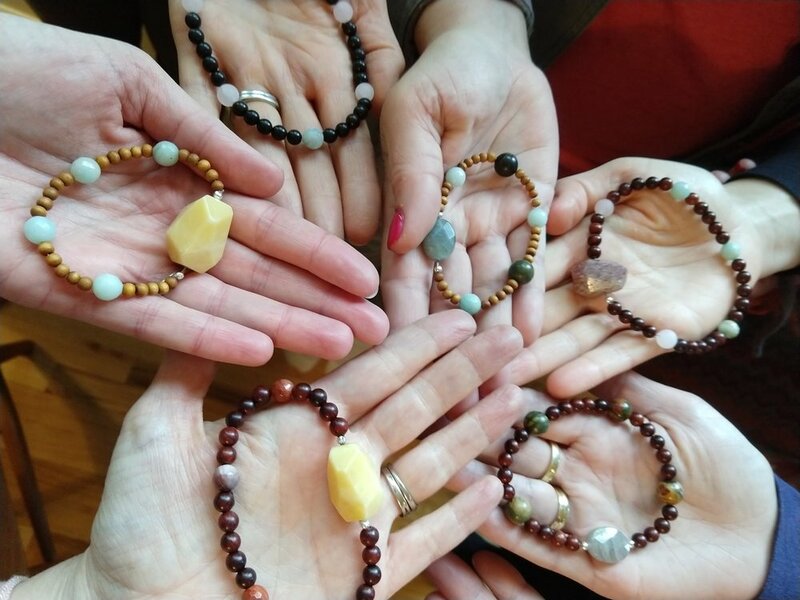 Meditation Beads Workshop, … and more! My corporate programs combine the latest science on habit change with hands-on exercises to give busy professionals tools they need to be focused, energized and resilient at work. I teach mindfulness and stress management habits that empower individuals and teams to do their work with deeper compassion and a calm and clear mind. Email kirstin@kirstinpinit.com for more information. Participants in my Meditation Beads Workshop show their creations. I create one-of-a-kind, custom jewelry to express, commemorate, and honor your life, love, change, and growth. The experience of working with me on a custom piece of jewelry is reflective, collaborative, and a unique experience in itself. The process is designed to reveal a new or deeper understanding of that which you are honoring and to commemorate it in a physical form. Here are some past projects to give you an idea of the work we can do together: Brave Joy, Fertile Soil, Flourish, Let Life Flow, Co-Creation, Touched by Our Edges. Do you love the idea of having a tangible reminder of your desires or transformation? Are you longing for a special talisman or amulet to hold close? I would love to work with you! This is me, carving a wax model for a custom design collaboration.